LEARN MORE – Southeast Geothermal, Inc. Imagine living in an underground home. You’re completely buried, just underneath the frost line. Inside the earth, the temperature is a cool and constant 55°F. One small heater is all it takes to raise your temperature to a comfortable 75° – year round, any season. Your heating and cooling bills would be almost nothing! But building such a house is problematic — there are issues with excavating, reinforcing, water seepage — in short, a nice idea but not always practical. But what if we brought the underground up? 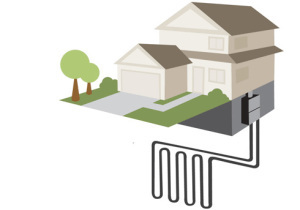 By sinking one or more deep wells and running a closed-loop water pipe into the earth, we can capture that constant-temperature environment and, in effect, bring it into your home! If you have excess heat in the summer, we pump it into the earth to cool your home. In the winter, we run ice-cold water into the earth to warm it, then use that warmth to help heat your home. 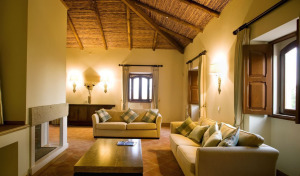 It’s like having an underground home above ground! These systems bury a long, flat pipe loop just underneath the frost line in trenches. There is no need for a drill rig, but the loop field takes up a great deal of space, requires a large, somewhat level area, and is very disruptive to the land surface. If a nearby pond or lake is available, sometimes loop coils can simply be dropped to the bottom of the pond, where the relatively constant temperature is similar to earth temperatures. Pond Loop systems can be the least expensive option where the situation permits. So, is this just the same as a heat pump? “Heat Pumps” usually refer to very inefficient combined heating and A/C units which generally consume huge amounts of electricity in both summer and winter. Geothermal is totally different. A small, efficient water pump circulates a closed-loop system of underground water. Heat is efficiently transfered to and from this constant-temperature loop, which can also be integrated with your hot-water system to increase efficiency even more. 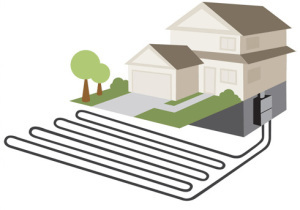 You’ll still use a small amount of supplemental heat from propane, natural gas or electric heating — but the geothermal system will instantly cut costs by 60-70% or more! Why hasn’t everyone done this already? Well drilling isn’t particularly cheap or easy (trust us on this — we’ve been doing it for 50 years) but there are several factors that make this a great option RIGHT NOW. One is tax credits. 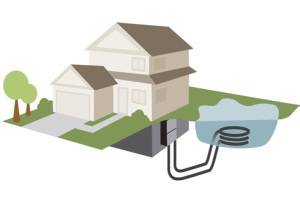 There is currently a 30% federal tax credit available for new geothermal installations. That’s 30% of your cost directly knocked off the top. There have been great price reductions and excellent new technology from the popularity of this “green energy” alternative. And finally, Southeastern Geothermal is certified and equipped to do everything you need — you don’t need to call one company for well drilling, and another for HVAC installation. We do it all. That keeps overall costs down, and lets us help you with total financing options. Spread the costs underneath your savings, and you’ll begin saving money right now.